It seems that every day there’s a new story about a security lapse, emergency lock-down, or violent act taking place at a school somewhere in the United States. Today it’s simply inexcusable not to have adequate security measures in place—regardless of how safe you think your community may be. In School Security, author Paul Timm, a nationally acclaimed school security expert, explains how to make your institution a safer place to learn with easy-to-follow steps. 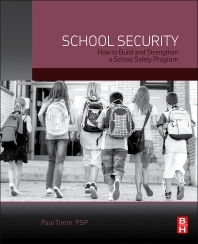 Throughout the book, Timm emphasizes a proactive rather than reactive approach to school security. Readers are introduced to basic loss prevention and safety concepts, including how to communicate safety information to students and staff, how to raise security awareness, and how to prepare for emergencies. The book discusses how to positively influence student behavior, lead staff training programs, and write sound security policies. An entire chapter is dedicated to describing what school security resources are available for follow-up reading and further training. School Security isn’t just a book for security professionals: it helps people without formal security training—namely, educators and school administrators—effectively address school risk. Security professionals and consultants; school administrators and staff at public or private K-12 schools, universities, or day care centers; and anyone who has responsibility for policy implementation or protective services in the school setting. 1. What Is School Security? 2. How Safe Is Your School? Introduction: How May I Help You? Paul Timm is a board-certified Physical Security Professional (PSP), president of RETA Security, Inc., and a nationally acclaimed expert in school security. In addition to conducting numerous vulnerability assessments and his frequent keynote addresses, Paul is an experienced School Crisis Assistance Team volunteer through the National Organization for Victims Assistance (NOVA). He holds a patent on a vulnerability assessment methodology known as ALPHAÔ and is certified in Vulnerability Assessment Methodology (VAM) through Sandia National Laboratories. He is a member of ASIS International, where he serves as vice chairman of the School Safety & Security Council, and the Illinois Association of School Business Officials (IASBO), where he serves on the Risk Management Committee. Nearing the completion of his MDiv at Moody Theological Seminary, Paul holds a degree in Speech Communications and a Certificate in Business Administration from the University of Illinois. President of RETA Security, Inc. and a nationally acclaimed expert in school security. amazing that someone at least cares about schools and knows what is good and what safety rules they should follow.